Inspired by the traditional Japanese art of origami, folding robots have emerged as an exciting new frontier of robotic design. 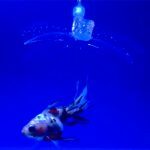 Printing robots and other complex devices through a process of origami-like folding is a promising manufacturing method due to the inherent simplicity and low cost of folding-based assembly. Unfortunately, a major shortcoming in this form of manufacturing has been the necessary dependence on external wires and batteries to power these folds. 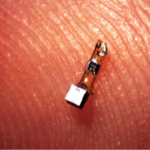 This has proven to be a problem for the functionality of small-scale folding robots and devices. Researchers at Harvard have recently found a way to overcome this issue. 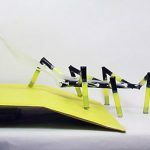 They have created battery-free folding robots that are capable of complex, repeatable movements powered and controlled through a wireless magnetic field. 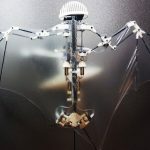 The research team’s robots are flat and thin plastic tetrahedrons, with three outer triangles connected to a central triangle by hinges and a small circuit on the central triangle. To make these devices move without batteries, the researchers installed two structures into their joints: coils of Shape Memory Alloys (SMAs), which return the bot to its original shape when heated, and miniature circuits that become energized when hit with varying levels of magnetic resonance frequencies. 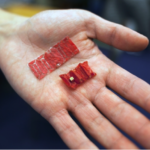 By changing the frequencies, the robots could be made to fold their joints on demand, and independently of each other. They were even able to fold multiple joints simultaneously by exposing the bots to overlapping electromagnetic frequencies. The team demonstrated multiple degrees of freedom at both centimeter and millimeter scales. 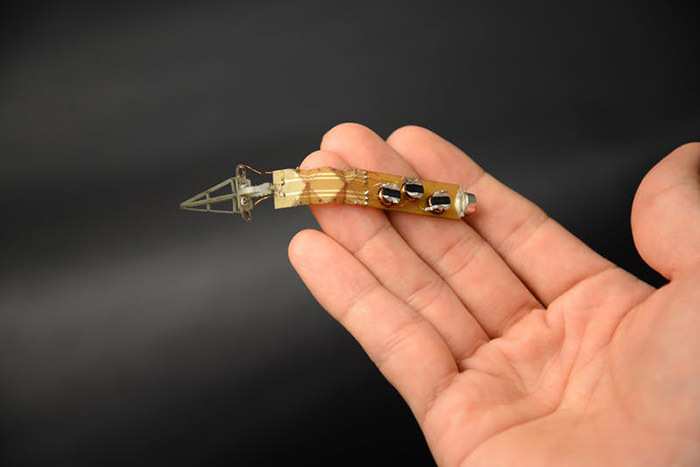 Consequently, one of the key applications that the researchers envision for this kind of minimalist robotic technology is a swallowable folding robot that can be substituted for an invasive endoscope. 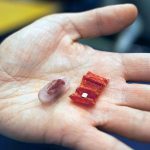 An alternative to having an uncomfortable endoscope put down their throat to assist a doctor with surgery, a patient could just swallow a micro-robot that could move around and perform simple tasks, like holding tissue or filming, while powered by a coil outside their body.